With the regular seasons wrapped up, the YAIAA basketball tournaments are set to start this weekend. The girls' tournament will begin Friday with four quarterfinal games taking place at Dallastown and Dover. The boys' quarterfinal matchups will be Saturday at Red Lion and West York. Here's a look at each matchup. Girls' rankings: Can anyone challenge our No. 1? Records: Fighting Irish are 17-4, 12-0 YAIAA Division III. Golden Knights are 14-8, 10-4 YAIAA Division II. These two teams just met on Feb. 1, with the Irish prevailing, 74-56. While York Catholic's Kate Bauhof and Eastern York's Hannah Myers both scored 33 points that night, the Irish got much more from their supporting cast with three other players scoring at least eight points. Will the Golden Knights get more from their role players this time? They'll need to if they want to win. Myers (17.3 points per game) has carried Eastern York all season, but Bauhof (18.0 points per game) is a more than worthy foil, which means secondary stars could once again decided this one. If Cassidy Arnold and Brooke Lacesa both have good games and Eastern can neutralize Irish forward Abbey Pilkey, the Knights will have a shot. Records: Panthers are 20-2, 11-1 YAIAA Division I. Eagles are 17-5, 10-4 YAIAA Divison II. Few teams in the YAIAA have been as entertaining as Dover this season. The Eagles have a lethal duo in sisters Rajah (18.9 points-per-game) and Rayah Fink (14.2) and finished the regular season with impressive wins over Eastern York and South Western. They'd be a tough matchup for a number of teams. But beating the league's top team in Central York will be far from easy. The Panthers are loaded, with senior shooting guard Emma Saxton (14.7 points-per-game) leading a lineup that also features point guard Katie Fabbri and forward Nikson Valencik. Central York has also been dominating its opponents, with its last five wins coming by at least 20 points. That includes a 25-point win over New Oxford, which beat Dover by 14 last week. The Eagles will have to play their best to make it a game. 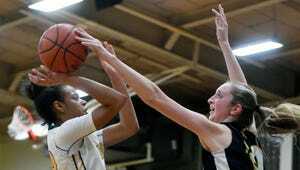 Records: Wildcats are 12-10, 10-2 YAIAA Division I. Squirettes are 17-5, 10-2 YAIAA Division III. It's a shame Delone Catholic isn't healthy entering the postseason. The Squirettes have played the entire season without top reserve Riley Vingsen, and have been without their best player Jill Novak since Dec. 20. Both players suffered ACL injuries. Still, Delone Catholic has enjoyed another strong season and has one of the best front courts in the league. Beating Dallastown, however, will take a strong effort from the Squirettes. The Wildcats might not have an impressive overall record, but they have beaten Central York and New Oxford this season and enter the tournament on a roll. They also have the height to deal with Delone forwards Bradi Zumbrum and Catie Apgar, and they've got a pair of guards in Julia Sutton and Sabria Royal who can cause matchup problems. But Delone is a well-coached team and plays every opponent tough, so it will likely be a good game. Records: Warriors are 18-3, 13-1 YAIAA Division II. 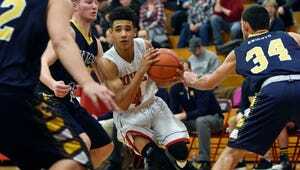 New Oxford is 17-5, 9-3 YAIAA Division I. This might be the marquee first-round matchup, with both teams having been among the league's elite this season. 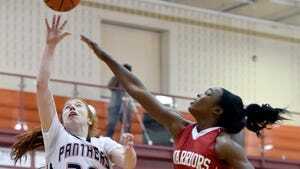 While some expected Susquehannock to take a step back this season, the Warriors have done the opposite. With a deep lineup and plenty of shooting ability, Susquehannock looks like a legitimate title contender. But can you really write off New Oxford? The Colonials looked shaky at the end of January — losing three games in a row to Dallastown, Central York and Boyertown — but they still have a senior-heavy lineup led by star forward Kaelyn Long. Both teams have a number of shooters, so this game could come down to which team is hitting its shots. Records: Fighting Irish are 20-1, 14-0 YAIAA Division III. Golden Knights are 14-8, YAIAA Division II. Eastern York looked like the class of Division II early on, but a number of injuries — including a torn ACL to leading scorer Jared Achterberg — has hindered the Knights season. On the other hand, York Catholic has dominated Division III with its deep and athleticism. If the Knights get strong shooting performances from players like Evan Springer and Trevor Seitz, they might be able to keep it close. 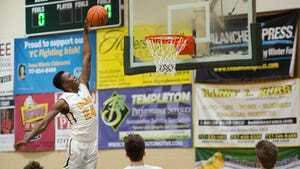 But 6-foot-5 Irish forward Melik Martin will be a major matchup problem, which gives York Catholic the advantage. Records: Bobcats are 20-2, 12-2 YAIAA Division I. Thunderbolts are 15-7, 10-4 YAIAA Division III. This one could get lopsided fast. No disrespect to Littlestown or head coach John Forster, who has done a terrific job in his first season, but the Bolts are outmatched. Northeastern may have lost to Central York and Spring Grove, but the Bobcats are filled with players who can run, shoot 3-pointers and leap out of the building. They're the top-ranked team in District 3 Class 5A for a reason. This game could be a great learning experience for the Bolts, who still have the District 3 playoffs to look forward to. Records: Rockets are 17-5, 11-3 YAIAA Division I. Squires are 12-10, 11-3 YAIAA Division III. This game looks like a Spring Grove blowout on paper, but Delone Catholic hung tough with the Rockets when the two teams played last Saturday. The Squires trailed by only six at halftime before eventually losing, 63-49. Still, it's hard to see Delone doing better than that effort in the rematch. Spring Grove head coach James Brooks and star Eli Brooks will make sure the Rockets enter the tournament focused, as the two no doubt want to win a second-straight league title. Records: Eagles are 14-8, 10-2 YAIAA Division II. Panthers are 15-7, 10-4 YAIAA Division I. Now this matchup could be interesting. While the Eagles and Panthers have flown under the radar this season, both are deep and can beat teams in multiple ways. Dover has four players (Keith Davis, Elijah Sutton, Victor Dorm, Brady Bowman) scoring in double digits while Central York has three (Courtney Batts, Garrett Markey, Landyn Ray). Although both teams have relied on varsity newcomers this season, Dover has no seniors while Central York has players like Batts who gained playoff experience last season. If it's a tight game in the fourth quarter, that experience could make a difference.